I wish there were stairs for a basement in this house plan! Other than that, this is just what im looking for! That is possible with some minor changes. I would extend the plan slightly to make room for stairs. Custom plans like this cost only a little extra. Email me at strawhouses [at] yahoo.com. Tell me exactly what you need and I’ll give you a fixed quote. I live in Houston, TX. It seems like this is the closest to a “breezy” house that is around the square footage I’m looking for. 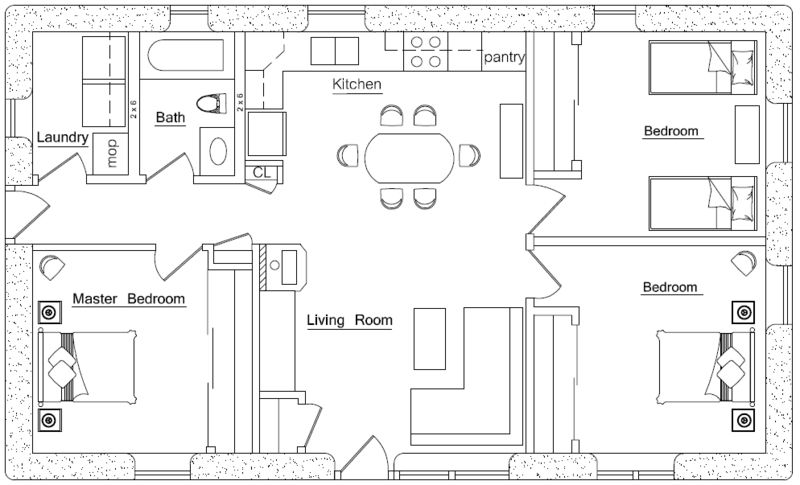 If the two bedrooms on the right were made into just one, then would the air flow through the house well with some repositioning of the windows on the far right wall? My favorite plan is the 10 meter roundhouse, but it looks like air flow through the house would not occur and would be a problem here in a hot climate. Is that correct? Also, I’m 59, disabled and have never done anything like this before. Any suggestions as to how to find a crew to build an earth bag home for me in this area? Austin has possibilities, but my searches are turning up nothing in the Houston area at this point. Thanks. I really wish it could include a wrap around porch or at least one that wrapped around half way around the house. Would really go for this then. seems a few people lack imagination regarding wrap around porches and verhandas! One big advantage of doing it this way is the plans are more applicable to a wider audience. People can more easily modify the basic shell to meet their needs and climate.